What prompted me this time was mainly a sale going on at Lowe’s and simple seasonality of needing to maintain the space around my air conditioning unit outside (before cranking it up for the summer, spring is a good time to have a pro check the coolant levels and to remove anything growing too close around it for efficiency’s sake). 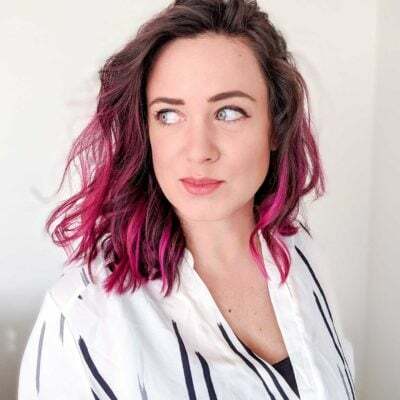 Then, with a tiny bit more effort, I found a couple more ways to save myself some additional cash (detailed below) and work in some long-term low maintenance. It’s just one of those things that I knew it would cost me a few more bucks if I waited, and if I could both knock out the majority of the project and save myself some money in the process, it seemed like a win-win. 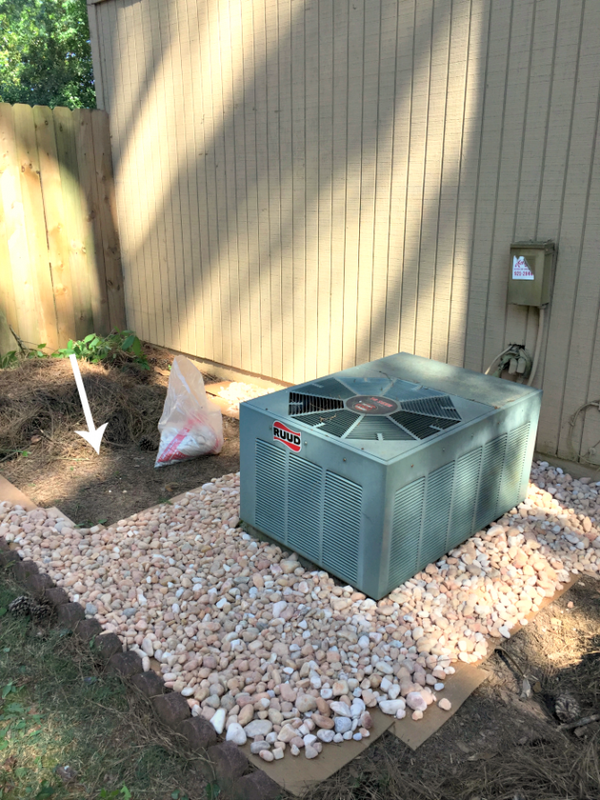 After first nixing the area as a possible place to stash my trash bins (more on that here), I’ve been thinking about removing the pine straw bed and adding landscaping gravel around the air conditioning unit. This side of the house is almost totally shaded during the day, which is great for the A/C unit, but it’s also prone to weeds and relatively unappealing-looking, so it could use some sprucing. For one, if covered over correctly, I don’t have to worry about weeding the area as much or about the vines that keep trying to climb up the side of the house. For another, the cedar siding is vulnerable to termites if mulched right up against the foundation. Generally-speaking, I think 15 inches away or more is what’s recommended, and mulching too closely can even void the warranty of a termite bond. 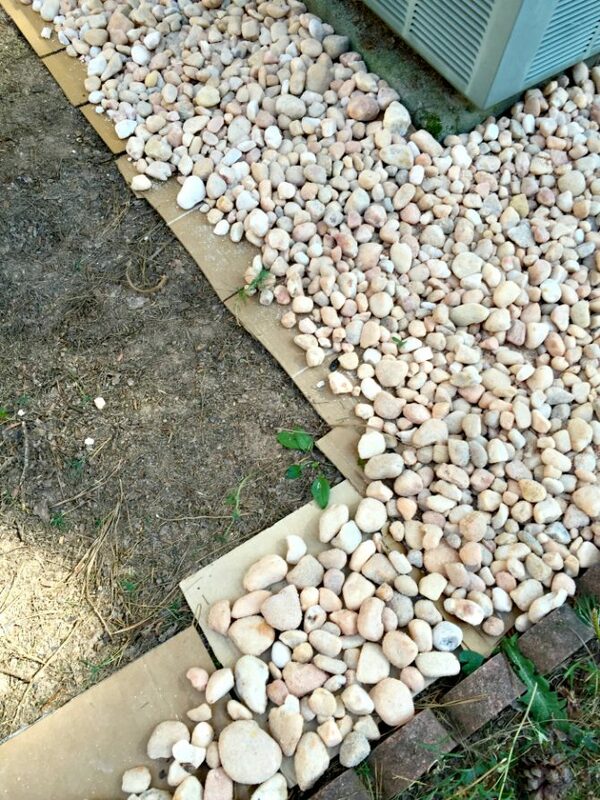 So, even though I like mulch a lot more than beds of pine straw aesthetically, I knew this wasn’t really the way to go (I could do rubber mulch like I have in other spots that were close to the house, but I just like the idea of stone over here instead). Also, after taking out the pine trees last spring and seeing how much of a difference it made for decreasing the amount of pine straw maintenance I have to do to the front yard (see the HUGE difference here), it also just seemed like something fun and new that I might have a chance of not getting completely covered up like in years past. So, away to the store I went, hoping for a good deal. If I found something, I’d go for it; if not, I’d wait. (*Links may contain affiliates, which sometimes happens when I link to stores I shop at*) Egg rock isn’t necessarily the decorative rock I would have noticed right away if it hadn’t been for the sale, but compared to the others I liked stylistically (marble rock looks particularly pretty to me), I realized that it was a really good choice for both my budget and that the color variation matched pretty closely with the reddish, orange, and gray hues in the stonework in the front of the house (the living room fireplace has the same stone). After loading up a couple of bags, the guys restocking the section informed me that if I wanted, I could grab any of the broken bags and get them for half off the sale price. The broken bags didn’t contain the full 0.5 cubic feet as the label said, of course, but each contained well more than half, so I’d get a few extra square feet (basically) for free. 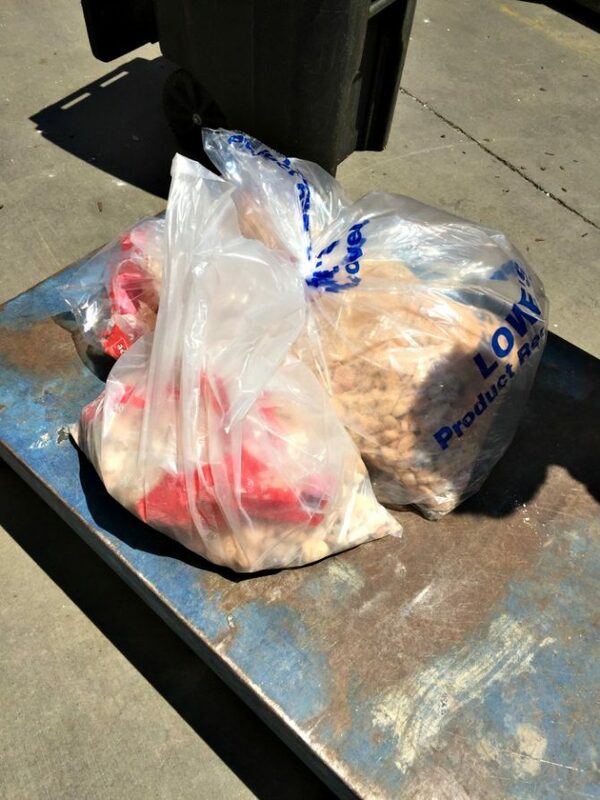 They even rebagged them so that the stones wouldn’t fall out in the car. Score! If I plan to keep the cardboard for this purpose, I do so temporarily and keep it away from water. It’s worked really well for weed-blocking in my garden beds, but cardboard is also known to attract roaches (and a place they like to hide), so you don’t want this sitting around in your house for a long time! I also try to remove any tape and shipping labels from the cardboard so that when it breaks down in the soil, I don’t have a bunch of trash under my mulch. 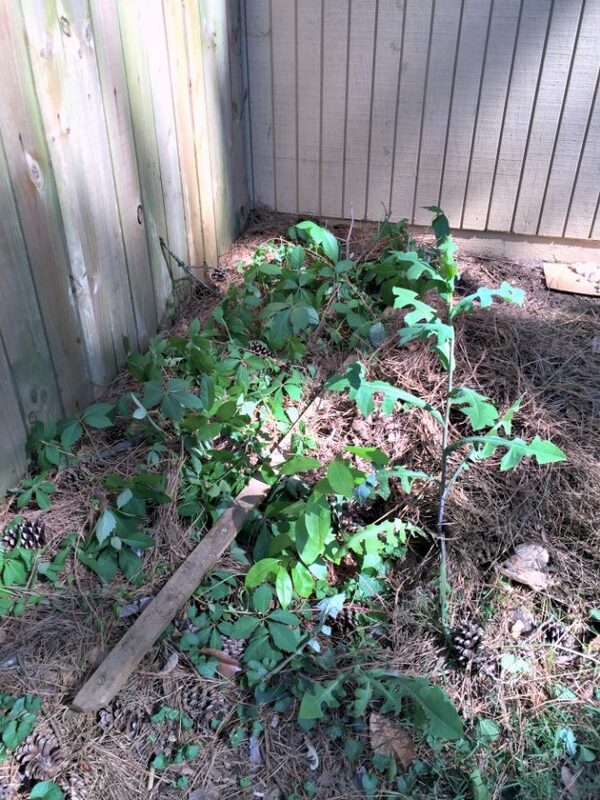 The air conditioner itself sits on a cement slab, so after sweeping out any pine straw from underneath the unit, I sprayed down any remaining vines or plant bits I saw with brush killer and put down the cardboard. 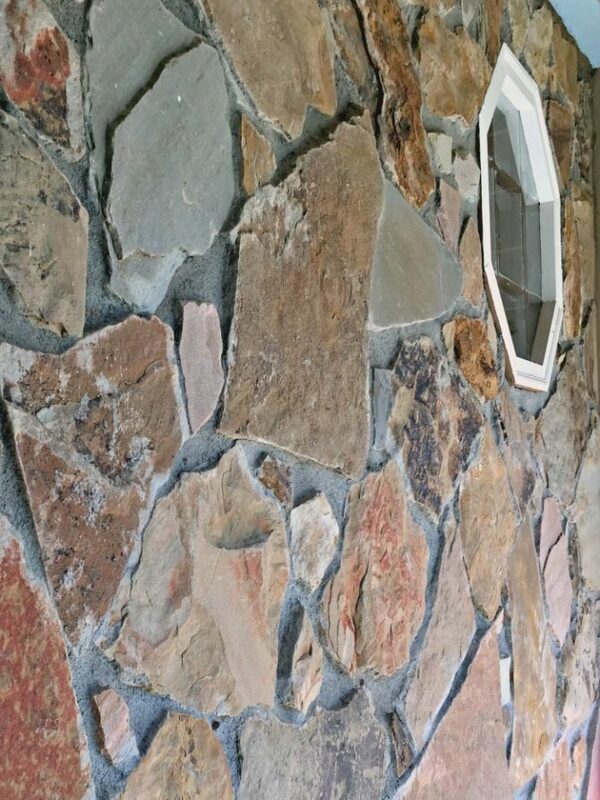 Then came the visually fun part: adding about an inch of the decorative stone on top. This gives me approximately 6 square feet per bag, so I was able to knock out the main area around the A/C unit pretty quickly. I didn’t have to do much leveling out of the ground either, but I made sure I filled and packed down any low spots with dirt before the stones went in (since I don’t want to have any puddles where mosquitoes can breed). The stones are good for erosion, too. Then, I took a careless step and put my foot directly on top of a small piece of discarded siding… that had a nail sticking straight up! Luckily, I was wearing some thick soles and the nail didn’t actually pierce all the way into my foot, but I was quickly glad I’d remembered to get my tetanus booster the last time I visited the doc (not to mention, let this be a reminder to always wear safety equipment and look where you step!). 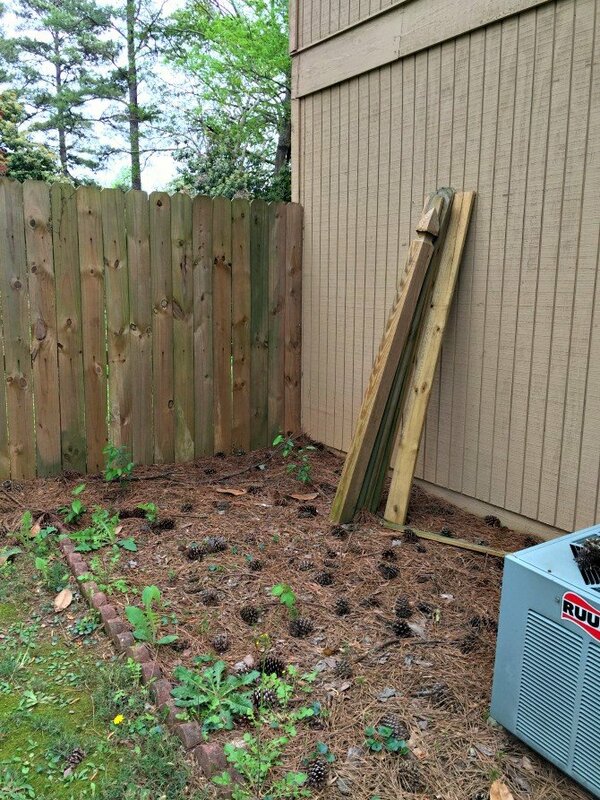 The board with the nails had been buried by a little pine straw, but I wound up accidentally covering it even more as I raked all of it to the side to start laying down the cardboard and rock. My guess is that the board was likely part of the discarded material from when I hired out last year’s siding repairs on this side of the house, but of course I can’t know for sure. Regardless, my back was starting to hurt from hauling bags of gravel anyway, so I figured that nearly jabbing through the ball of my foot was enough of a good reason to call it a day. 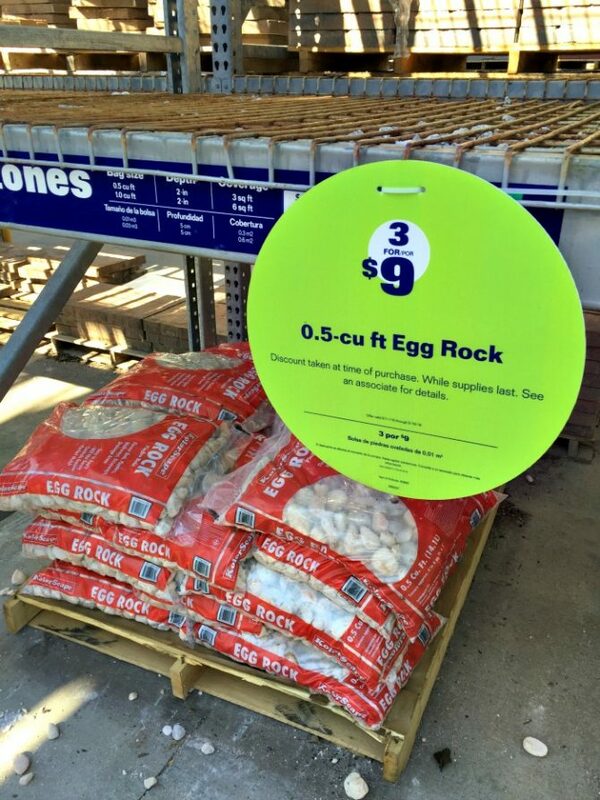 I also ran out of rock altogether, so I needed to go back to the store to grab the remaining bags before the sale ended. I still need to fill in the area closer to the fence and in the corner next to the chimney, but it’s off to a great start, and now you know what to look for the next time you want to get a little more gravel for the money! I’ll have a final reveal soon, but I’m also not planning on filling in the whole area with gravel, so I would love to hear some of your suggestions on what to plant. I’d like to put some shade-loving shrubs on the left side that don’t defoliate or otherwise shed in a way that could potentially blow into the A/C unit (that would kind of defeat the whole low-maintenance goal of the project). So far it seems like monkey grass, holly, and hostas are common suggestions, but none of them really strike me as a favorite yet. What would you plant? Understanding that I think the hydrangea is the most perfect plant ever :) I’d throw a couple of hydrangeas over there. They are mostly shade loving, but it looks like you get enough dappled light to sustain them. Plus you’d get gorgeous big blooms and pretty deep green leaves. They do shed some throughout the year, but not enough to be a pain. I have them all across the front of my house and they rarely require more than a quick raking in the early fall. I second the Hosta, as there is so much variation that you can probably find a type to suit your preference! This looks so nice already! I like Coleus as they don’t defoliate (much, I mean they are technically not supposed to drop leaves) and come in all sorts of colors. Wow, gorgeous! Loving some of those varieties with the deep red. Will do some research; thanks so much for the suggestion! That looks really good! Instead of little hosta, try a giant one like Sum & Substance or one of the others. The greater the shade, the better. Are hosta year round in GA? They die down here in CT in the late Fall. Hard to say. I have one that came back after looking pretty sickly, but it could be the variety or something. Perhaps I should just plant a number of different varieties of them in a bunch and see if that makes me like them any better. Mophead hydrangea likes shade too. They are lovely. 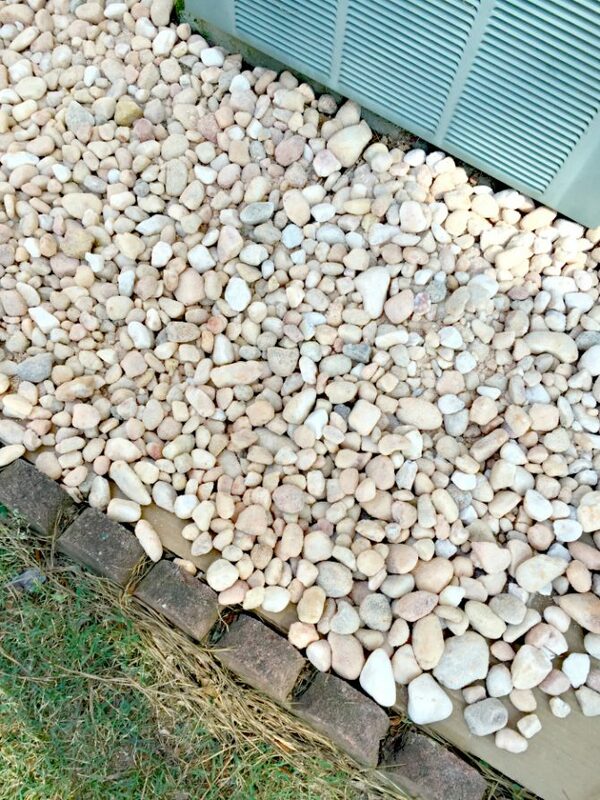 I had to keep redoing my air conditioner area and adding rock at my last house because the ground squirrels. gofers kept digging holes around and under it. What would look lovely toward the back in the corner would be a 3-4′ Hibiscus with a few taller Day Lilly ( which will flower all season long if you pop the blooms daily ) maybe some shorter Ajuga -ground cover up front. Or if you want less work & maintenance a Dwarf Japanese maple ( great color ) or Twisted Willow which doesn’t get too tall when groomed would look really nice in the area. You have a nice long growing season, you do have a wide selection to choose from. Coleus would look great in this area as mentioned and add so much color, are easy to grow and propagate. Try rhododendron or azaleas. They’re both pretty fast-growing plants that will give you bright flowers in the spring. Boxwoods are also a great choice, and there are so many different varieties. All three suggestions keep their leaves during the winter (which is a major bonus for me being in New England since things tend to look quite dead for a good portion of the year here!). Have you considered Purple Heart? Lots of colour, tiny sweet flowers and coverage. Easy to grow and so vivid! I couldn’t really tell how much space you have there to fill in, but I second the suggestion of boxwoods, I have some and I love them, but they are in a sunny-ish spot. Another one I would suggest if you have the room for it, is a shade-tolerant evergreen that gets to 8ft tall, but gets there slowly so you won’t have to do much maintenance: yellow anise (Illicium parviflorum). I have Gold Splash ColorChoice Euonymus and love it. Easy care, doesn’t drop leaves, etc. Maybe worth a look. I think those are the ones I have in the front yard, but I could have a slightly different variety. I love the color, too, and they thrive in the sun… this area is almost all shade, all the time. They do look awesome though, especially in the fall when the leaves change to a slightly reddish tinge on the tips. I planted one more in front of the house last year just to give the house balance and curb appeal. I would find an ornamental grass that is native to your area. OG’s are usually very low maintenance and many attract butterflies. Native ones are key as they will attract the best and will grow nicely with the least pest problems. Shrubs provide dense greenery to hide the central air unit. As the bushes grow taller, they also provide plenty of shade for the air conditioner. I loved what you did with the egg rock! I’ll admit, you got me with the blog title, haha. But the blog is great! I love the advice about using cardboard for weed blocking and from your pics, it looks like it came out swimmingly. Alumroot and Hosta could be a good choice. Alumroot flowers so the petals may blow into the AC unit though. 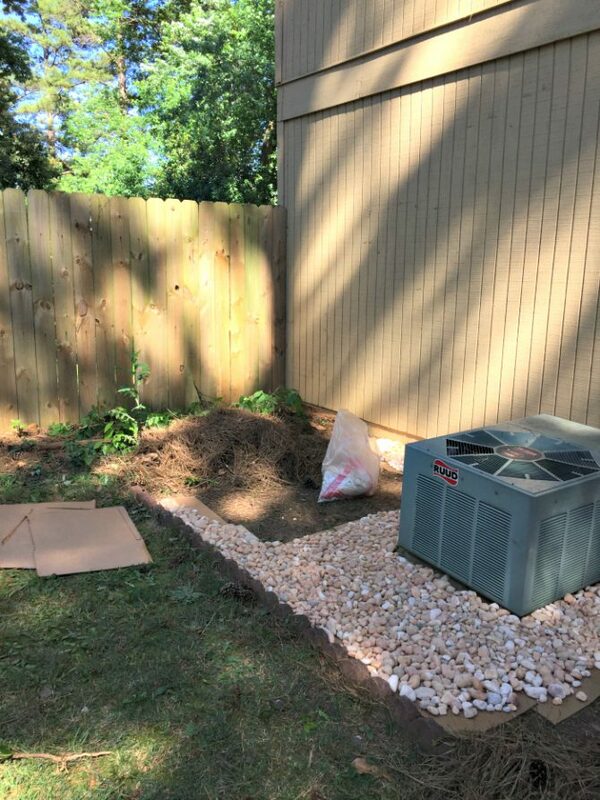 Looks great, I’ve been trying to think of something I could do around my AC unit to make a barrier for the kids and adding some plants and stones might work for me.